OUR INSPIRATION What’s old is new again. Restauration is a combination of two of our favorite words that are defining pillars of the Long Beach community: restaurant+relaxation. Situated in the vibrant and creative stretch on 4th street between Cherry and Temple dubbed Retro Row, our little eatery brings the Long Beach family together to pay tribute to the American culinary spirit while embracing modern fare. OUR APPROACH Our food and ingredients are locally sourced and responsibly grown, using seasonal ingredients based on the abundant bounty available on the Southern and Central Coast. Many options are served family style intended for sharing. Our beer offerings feature craft beer on draft and in large bottles from all over the world. The comprehensive wine list highlights small producers from California and other unique wine growing regions from afar. OUR PLACE Our vision was to create an environment that encourages an audience to stay awhile and brings them together in a hospitable space. We were able to do just that by recrafting the interior and exterior space with an urban style that integrates vintage and upcycled materials for a comfortable yet sophisticated feeling. 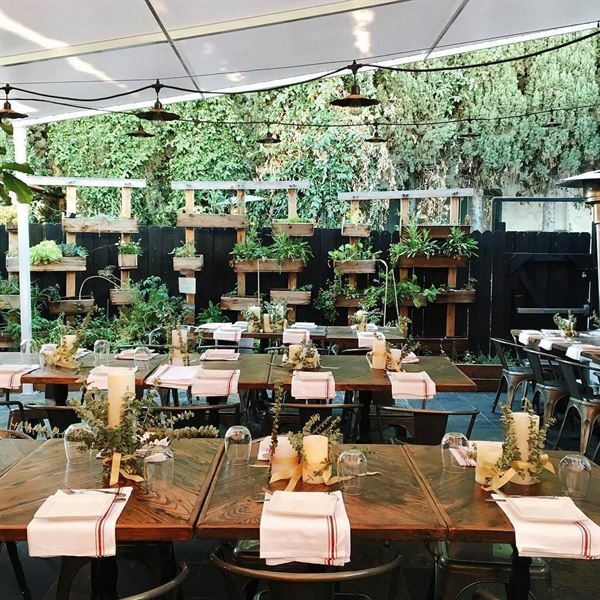 Repurposed lighting, handmade tables & benches, a 75-seat patio encircled with vertical gardens that are warm yet refreshing all contribute to the inviting atmosphere. Lunch & Diner Offerings Boxed Lunches | $17.95 per person - Select a sandwich and two sides/sweets Platters for Sharing | $30 - 45 per person • Cheese & Meat • Farmer's Market Crudite • Bar Snacks Sandwiches | $90 - Can be served on platters for buffet service or in boxed lunches with two sides/sweets picnic-style. Price is for 10 person order. • Farm Sandwich • Mushroom Melt • Club BLT • Cali ALT • Smoked Fish Tartine • Avo Toast Warm Proteins | $75 - 95 - Served on platters a la carte can be paired with two dishes/sweets for boxed lunches. Price is for 10 person order. • Roasted Chicken Breast • Braised Short Rib • Seared Local Albacore • Grilled Flat Iron Steak • Bone-in Pork Chop • Crispy Pork Belly • Cauliflower Steak Please see attachment for additional menu options. The Belmont Social - Reception style starters and nibbles for a sit-down or stand-up gathering. • Thick-cut Garlic Fries • Tortellini • Fried Oysters + Chips • Chimichurri Skewers • Smoked Salmon Tartine • Bruschetta • Duck n' Waffle Bites • Avocado Toast • Parmesan Churros • Wood-Fried Pizza The Heights Lunch - A combination of casual fare for all to enjoy during a daytime gathering. Available at lunch only. Can be served individually, buffet or family-style depending on your party size. Starters - Select Two • Thick-cut Garlic Fries • Grilled Cheese • Tortellini • Fried Oysters + Chips • Duck n' Waffle Bites • Chimichurri Skewers • Bruschetta • Parmesan Churros • Roasted Vegetable Crudite Lunch Entrees - Select Three for Guests to Choose From • The Burger • Grilled Cabbage • Shrimp & Chorizo Hash • Farm Sandwich • House Salad • Beets + Grains Salad • Smoked Salmon Tartine • Wild Boar Sausage Please see attachment for additional menu options. Our hidden gem is a private patio nestled behind the restaurant off the street. The patio can comfortably seat 75 seated or more for a casual cocktail-style reception. Sail shades, bistro lights and vibrant vertical gardens encompass the patio and make it perfect for an intimate gathering in the evening or lovely afternoon brunch for parties of 10-75. Our quaint dining room is small but packs a big punch. Perfect for a party of 18-25 that wants the whole place to themselves for lunch, dinner or brunch. Atmosphere/Decor: Modern rustic, velvet upholstered banquettes, repurposed lighting and decor, zinc plated tables, pops of jewel-tone teal and yellow. Special Features: Private outdoor patio that is covered and can be heated in cooler weather. Vertical gardens fence in this hidden neighborhood gem that is perfect for gatherings of nearly all sizes and occasions.